Chrome plated compression fittings, valves and tube give the ultimate in quality finishes for kitchens and bathrooms both in domestic and professional settings. The fittings listed on this website are the fittings we keep in stock, we can arrange for any fittings or brassware to be chrome plated. Please contact us with your requirements. 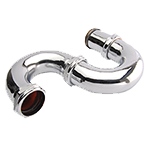 A chrome plated finish gives a beautiful look to any plumbing application. We stock the full range of chrome compression fittings from 15mm to 54mm. If you are using Chrome compression fittings then you need the tube to match. We stock tube from 15mm to 54mm. Need something a little different? We can have most metal items chromed. Chrome plated copper tube. Manufactured in the UK to EN1057. Available in 15mm, 22mm, 28mm, 35mm, 42mm & 54mm. Make your waste pipes look beautiful. We also stock P Traps. Available in 1¼ inch, 1½ inch and 2 inch. Ideal for kitchen and bathroom visible pipework. Available in 15mm, 22mm, 28mm, 35mm, 42mm & 54mm. For the best look in professional installations. Available in 15mm, 22mm, 28mm, 35mm, 42mm & 54mm.